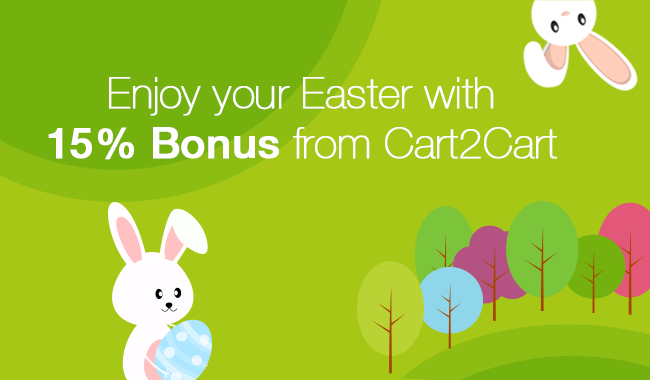 Rejoice and celebrate with Cart2Cart, as a bright Easter day is already on the doorstep! While all the people have yet another reason to gather around the holiday table, Cart2Cart joins the festivity and gives its clients wonderful presents. On the occasion of Easter, everyone has a chance to get some “egg-stra special” bonuses on their accounts! Refill your Cart2Cart account from March 31 to April 8 and get 15% bonus! The funds you’ll get have no expiration date and can be used whenever you want on any service offered by Cart2Cart. Thus, its a wonderful possibility to make your migration 15% cheaper! Have a happy Easter celebration and spend it with the people you love and cherish.And remember - the bigger sum of money you add to your account, the bigger bonus you get! Please note, the Easter bonus program will be active till 6 p.m. (UTC+2), of the 8th of April. Bonuses will be added to your account automatically right after you add funds. You don’t have to apply discount code additionally.